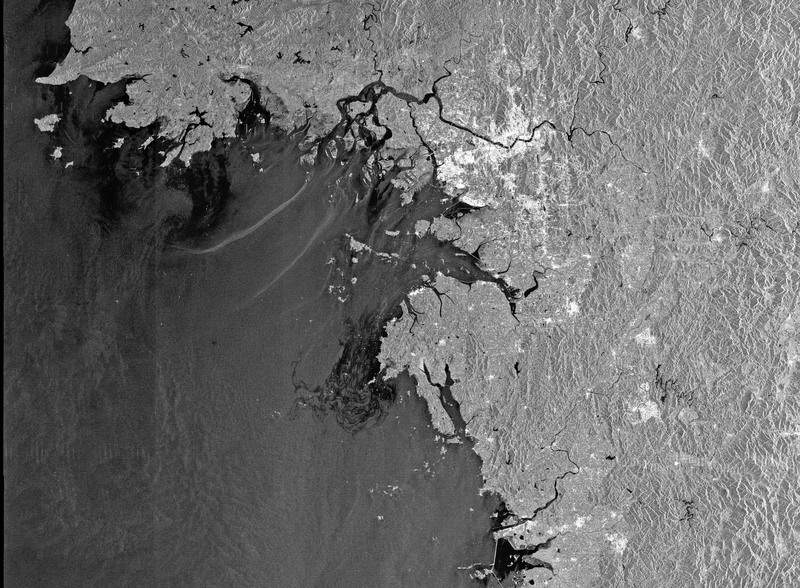 Crude oil from the wrecked 146,000-ton tanker, Hebei Spirit, is seen polluting the sea off South Korea in this Envisat image, provided by the European Space Agency. The image was acquired on December 11, 2007, at 10:40 a.m., local time (01:40 UTC) by the Advanced Synthetic Aperture Radar (ASAR) aboard ESA’s Envisat satellite. 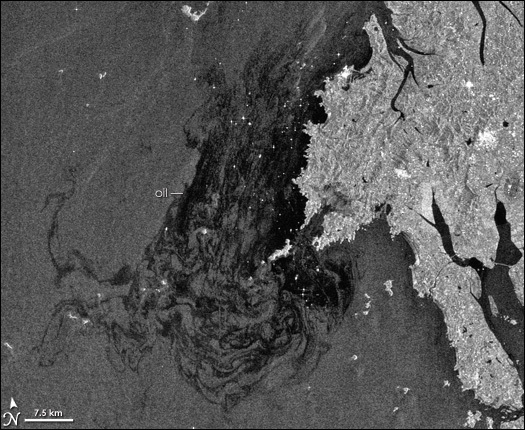 Oil spills are hard to see in photo-like satellite images because the ocean surface is already dark. Radars, which shoot energy pulses toward the surface and measure the intensity of the signal that returns to the satellite, have a better chance at detecting oil. The presence of oil on the sea surface damps down smaller, wind-generated waves. It is these waves that typically reflect the radar signal back to the satellite. When the waves are damped, the energy reflected by the ocean surface decreases, causing oil slicks to appear as dark areas on an otherwise brighter sea. Like other space-based radar instruments, ASAR essentially provides its own source of illumination and operates at longer wavelengths than optical (camera-like) sensors. This technology enables it to observe the Earth’s surface at night and through thick cloud cover.